What happened to the men in development? The past 30 years have seen a monumental shift in development policy, wherein women have taken center stage; indeed, it’s been said that ‘development has a women’s face’. Women’s empowerment and gender equality are recognized as crucial to poverty alleviation and as a pathway to achieving the Millennium Development Goals. More than any recent period, women are seen as important actors in the development process. In fact, in two of the most visible development tools currently in circulation – microfinance and the Conditional Cash Transfer (CCT) – women are the essential actors. Now it might seem an odd comment coming from a women and gender studies scholar, but I can’t resist asking: what about the men? What kinds of messages are development institutions sending to men when they explicitly exclude them from programs meant to alleviate poverty and improve social welfare? Isn’t it the case that a more gender-inclusive paradigm could better address the real issues facing developing communities? In this case, microfinance refers to ‘a range of financial services including credit, savings, insurance, money transfers, and other financial products provided by different service providers, targeted at poor and low-income people’. Microfinance institutions (MFIs) are mostly focused on the provision of microcredit, ‘very small loans for unsalaried borrowers with little or no collateral, provided by legally registered institutions’. The most well-known organizations include the pioneering Grameen Bank and the Bangladesh Rural Advance Committee (BRAC) both of which are based in Bangladesh but now have programs in multiple countries. As development programs, microfinance initiatives can be found throughout the world, implemented by a diverse range of state and non-governmental institutions. While not (yet) as popular as microfinance, the Conditional Cash Transfer (CCT) is an increasingly utilized tool for tackling poverty. The first two CCT programs came out of Latin America in the 1990s – Mexico’s Oportunidades and Brazil’s Bolsa Familia – but CCTs now form part of social policy agendas in over thirty different countries. In a CCT program, small cash payments are made to women heads of households – or mothers – to be used towards the purchase of food, clothing and other basic provisions thought to facilitate child school attendance and increase household nutrition. To ensure the continued receipt of payments recipients must meet certain conditions, principally quotas for school attendance and regular child health checks. In some cases, the mothers must also attend educational classes on such things as sanitation, reproductive health and nutrition. Checks are made to ensure that these conditions are met. If they are not, or if their income goes above the program threshold, the mothers and their families can be expelled from the program. These two development approaches have many similarities. Like micro-finance, CCTs are premised on notions of investment in and responsibility for ensuring better outcomes. Both approaches came out of the global South, and both are enthusiastically supported (monetarily and discursively) by the World Bank. Arguably one of the most interesting characteristics that these paradigms share, however, is their deliberate targeting of women – to the exclusion of men. Like the CCT, microfinance is overwhelmingly geared towards women – and for similar reasons. 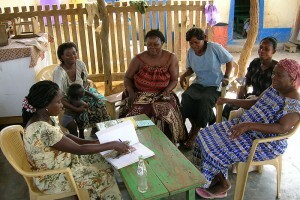 Both approaches operate under the assumption that women are more responsible than men: women are more inclined to use profits (in the case of microfinance) or payments (in the case of the CCT) towards the wellbeing of the family and investment in the household, whereas men are more likely to use them for personal benefit. Particularly in the case of microfinance, the explicit focus on women borrowers hinges on a debate about female empowerment. Access to credit is considered by some (including founder of the Grameen Bank, Muhammad Yunus) to be a fundamental human right, and one from which a great majority of women in the global South have traditionally been excluded. This model understands women as becoming empowered as they become self-helping economic actors, with income at their disposal to invest in the welfare of their families as they see fit. It is true that women traditionally assume the majority share of caring work in households – that is, caring for the sick, seeing children off to school, and ensuring that nutritional needs are met. Women are assumed to be, and indeed overwhelmingly are, responsible for day-to-day family welfare. CCT programs recognize that women do the majority of this work and for this reason place the money in their hands. MFIs build their credit lending programs on similar assumptions. That said, it must be noted that women are no more biologically nor innately orientated towards fiscal responsibility than are men – nor are they any more inherently prone to changing diapers or feeding hungry mouths. The responsible and care-giving roles that women assume are socially constructed, meaning that they are learned and reproduced through tradition and culture. Men too assume socially constructed roles, and are not themselves any more biologically prone to spending income in bars or on prostitutes (as the stereotypes go) than are women. If roles were reversed and men were more directly responsible for the day-to-day wellbeing of children and dependents, would they not also be more inclined to direct available funds towards the household? To buying food, patching the roof, and purchasing medicines? If indeed a persistent problem in poor communities is a lack of male involvement in family welfare (which is certainly debatable) would that not constitute a larger issue deserving of attention in and of itself? While microfinance and CCT programs rightly recognize the persistence of female poverty, wouldn’t a more transformative model of development seek to incorporate all people living in conditions of poverty? In targeting women as the primary agents of development, these programs implicitly and explicitly acknowledge the importance of the caring and responsible roles that women traditionally assume. While the access to financial resources that this acknowledgement brings is certainly welcomed, would further efforts to encourage men to assume part of the burden not equate to even more meaningful empowerment? Should men not also be recognized for their contributions to family welfare? And when and if these contributions are insufficient, should they be encouraged to act more ‘responsibly’? We need to shift the way in which we think about women (and men) and development. Poverty and low levels of human welfare are not based solely on economics, nor is ‘adding women’ the answer. Moving beyond seeing women and men as distinct categories to consider instead gender relations – or the dynamics of power and inequality between men and women and in relation to one another – is imperative. A gender relations approach prompts development planners to ask more critical questions: why do economically inactive women have low decision-making power in households? And why is it that when women take on work outside the household, their male partners don’t share the unpaid labor burden within it? Women were not excluded from previous development approaches ‘accidentally,’ and victims of domestic violence are not disproportionately female by an unfortunate stroke of luck. Social and cultural perceptions of men and women and their relationships impact women’s – and men’s – wellbeing. We must ask who benefits, and in what ways, from how these relationships are structured. A gender relations approach allows for structural causes of inequality and oppression to be brought to the foreground. Including women into the current development paradigm is an essential step, but it must not be the end goal. Responsibility for a meaningful and transformative development cannot – and should not – rest on the shoulders of only half the population. My argument is not for a backtracking to the days where women’s social and economic contributions to development were sidelined in favor of male-centric paradigms. Rather, it is about giving credit where credit is due – and where it is not, it’s about encouraging accountability. Meaningful female empowerment is based on an equalization of gender relations – the relationships of power between men and women, and the ways in which their socially constructed roles are valued in society. In order for microfinance and CCT programs to facilitate the kind of development that both empowers women and improves welfare across the board, everyone – male and female – needs to be included.